At their final meeting for 2015, the Bronxville Historical Conservancy presented their first Bronxville Historical Conservancy Preservation Award to Peoples United Bank for their restoration of the 1920s Gramatan National Bank clock. The award was created to honor individuals, organizations, and businesses that have strengthened the fabric of the Bronxville community through their exceptional commitment to preserving an understanding of its rich past and unique character. Projects considered eligible for this award fall within one of seven specific categories: Architectural Restoration, Conservation of Architectural Elements, Renovations and Additions, Garden and Landscape Design, Craftsmanship and Fine Arts, Preservation of the Historical Record, and Stewardship and Advocacy. The Conservation of Architectural Elements was the category in which the Conservancy made their first award. Stephanie Weston, Vice President and Market Manager, was on hand to accept the award on behalf of the bank. 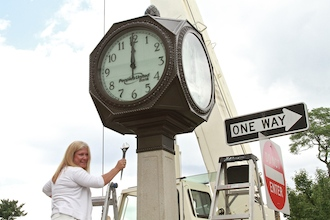 “This was a true collaboration between People’s United Bank and the Bronxville Historical Conservancy,” Weston said, “Eloise Morgan did a lot of research and the Conservancy was a huge help to the bank in restoring the clock to its original splendor. People’s United Bank is truly honored to play this meaningful role in preserving Bronxville’s rich history.” The award is a bronze cast plaque designed by Conservancy Board member and architect Anderson Kenny. Criteria for nominations for 2016 Preservation Award, please click here.